Alongside the launch of the iPhone XS, iPhone XS Max, and iPhone XR, Apple has introduced a new AppleCare+ plan that's designed to protect against theft and loss. 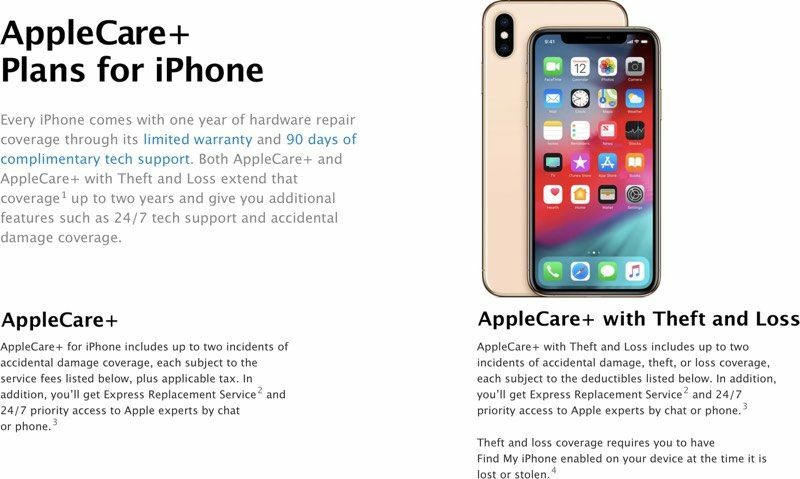 AppleCare+ with Theft and Loss is priced at $299 (or $14.99 per month over 24 months) for the iPhone XS and XS Max and allows for two incidents of accidental damage, theft, or loss coverage, so long as the purchaser pays the deductible. As with regular AppleCare+, Apple will repair accidental damage for $99, but a lost or stolen phone will be more expensive. It will cost $199 to get an iPhone 8, iPhone 7, iPhone 6s or iPhone 6 replaced, and $229 to get an iPhone XR, iPhone 8 Plus, iPhone 7 Plus, iPhone 6s Plus, or iPhone 6 Plus replaced. For a replacement iPhone XS, iPhone XS Max, or iPhone X, customers will need to shell out $269. Getting a new iPhone will require the device in question to have Find My iPhone enabled. Disabling the feature voids coverage, according to Apple. AppleCare+ with Theft and Loss will be available as a purchase option when pre-ordering an iPhone XS or iPhone XS Max this Friday. It will also be available for the iPhone XR when that device becomes available, and based on the pricing of the plan for the iPhone 8 Plus, it will cost $249 or $12.99 per month for 24 months. Apple is continuing to sell standard AppleCare+ that offers coverage for two incidents of accidental damage but no theft or loss coverage. Regular AppleCare+ for iPhone XS and iPhone XS Max will cost $199, so the Theft and Loss coverage is $100 more expensive. Another way Apple can exploit cash from us? More and more and more and more money. As with any insurance, don't buy it if you don't need it. For people who DO need it, it's a valuable service. I'm truly sorry Apple actually makes money doing business; perhaps you live a life of poverty in service to others, and we should all emulate you? Well crap, That is like $600. What good is that? Just pay yourself and put the money aside each month and pay yourself if you need to, keep your money. Stop making tim cook wealthy! For $299 only Apple will use Find My iPhone to send their security experts to go beat up the thugs and get your iPhone back! "Theft and loss coverage requires you to have Find My iPhone enabled on your device at the time it is lost or stolen" Yet they make you turn off Find My iPhone when requesting an express replacement, thus leaving your phone vulnerable for a few days while you wait for the replacement. Makes no sense. Probably a way to prevent fraud. "I cannot find my iPhone! I'd like a replacement." Sir, give me your Apple ID and authorize us to find it. Cool. It says it is in your home. Try not to lose your phone, guys. This is a pretty simple decision to pass up on. $299 for a warranty that includes a theft and loss plan is actually pretty damn good. The deductible for the replacement at $269 puts a replacement phone at $568 - a hell of a lot less than the base $1000, and significantly less than the $1449 for the 512GB iPhone XS Max . For those complaining about price, just do the math. And, if you don't want the theft and loss coverage, just go with the stand AppleCare Plus for $199. Being a clumsy drunk while living in NYC, I can really benefit from this. I somehow haven’t gotten my IPhone X snatched and I will definitely get this when I upgrade!